We require a deposit of £75 which will also act as your security deposit, this will be returned to you within 7 days of your departure providing that on inspection there is no damage or missing items. Lost keys will result in £10 being deducted from your security deposit. Full Payment must be made at least 4 weeks before your stay. We love our caravan and take pride in it. It is after all, our second home. We would hope that you would treat it as you would your own home and enjoy making wonderful holiday memories here. 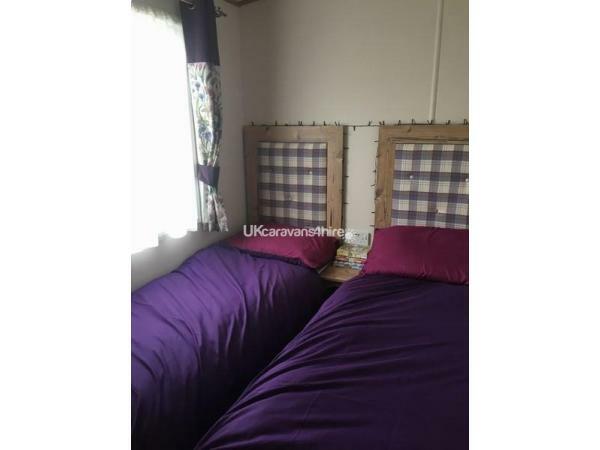 You will find our caravan is double glazed and insulated throughout with gas central heating. 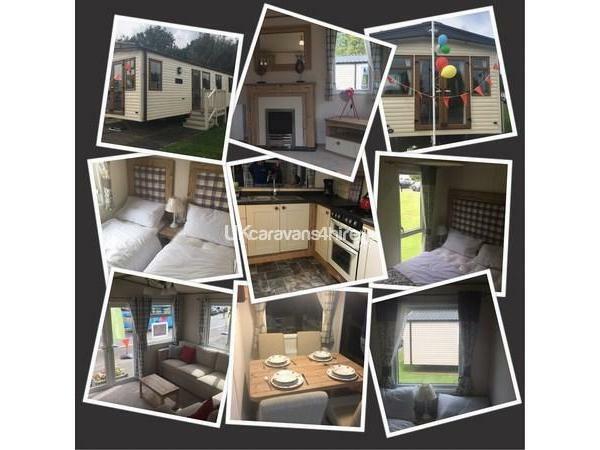 French doors which opens onto a large gated veranda that wraps around the caravan giving a large outdoor area to enjoy on warm evenings and a secure area for the little ones to play in. You will find a comfortable living room with an electric fire, that boasts a 42” smart TV with Freeview and a separate DVD player. You will also find a Wii games console with a selection of games and family board games to enjoy together. 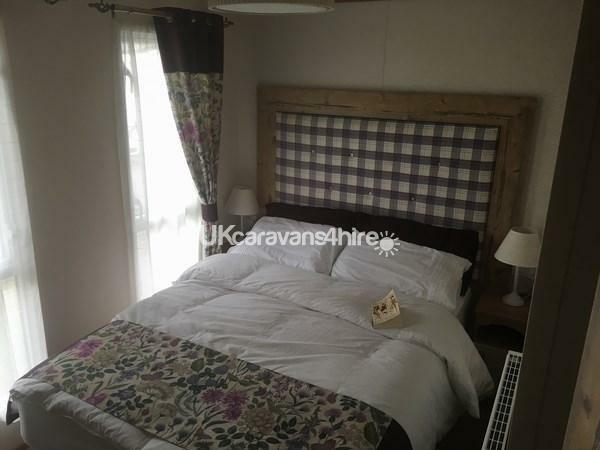 Our caravan has 3 spacious bedrooms, one double bedroom with a TV and an en-suite toilet and basin. 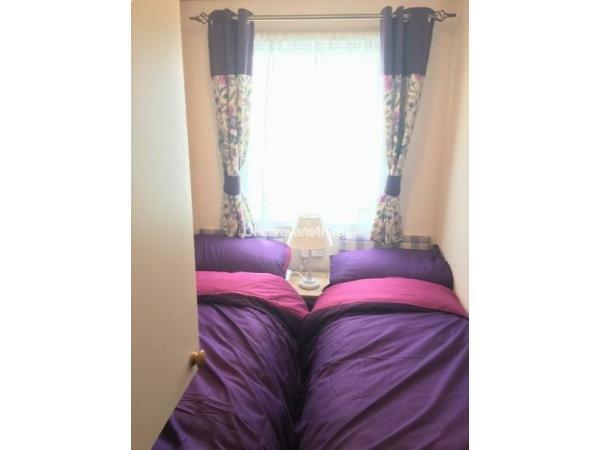 Two good sized twin bedrooms, one bedroom also has a TV. All necessary pillows, duvets and bedding will be supplied and rooms made up ready for your arrival. Our kitchen is a beautiful modern space with a full sized fridge and freezer, integrated microwave, kettle, toaster, slow cooker and gas oven & hob. All the necessary pots, pans, crockery are provided. Help yourself to the tea, coffee and sugar. We will also provide a Vacuum cleaner, Mop, and all cleaning products you may need including, dish cloth and washing up liquid. 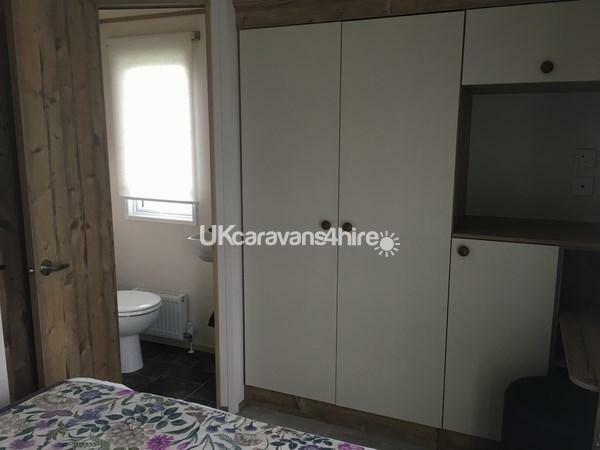 Has a large walk in shower, basin and toilet. Please note - Bath towels, hand towels & tea towels are not included. The sandy beach and the entire main entertainment complex on Thorpe Park are all within a 5-8 minute stroll from our location. There is an onsite bus stop to take you into the main town or nearby Grimsby you will also find restaurants and entertainment venues such as Beachcomber & McCormick’s just outside of the park. We can recommend The Trawler man for a delicious Carvery. Pub/Club, Fishing, Amusement Arcade, Tennis Court, Indoor Pool, Golf Course, Laundrette, Crazy Golf, Pitch and Putt, Grocery Shop, Takeaway, Restaurant, Kids Club, adult & children’s evening entertainment, bungee trampolines, go-kart hire, climbing wall, leap of faith pole, zip-line, archery and fencing, children’s mini-funfair, lazy river and space bowl plunge flume, kayaking, aqua Jets and Aqua gliders, water walkers - Some activities do have additional fees. Adult over 14 years, Child 4 - 14 and under 4’s go free. We require a deposit of £75 which will also act as your security deposit that will be returned to you within 7 days of your departure providing that on inspection there is no damage or missing items. Lost keys will result in £10 being deducted from your security deposit. Full Payment must be made at least 4 weeks before your stay. Failure to pay will result in the loss of your deposit. Strictly no smoking or vaping inside the caravan. No pets allowed. (However we have a family pet which does go in the van so may not be suitable for people with allergies).